At one point during the Theatre Roundtable’s annual Awards Night on Sunday, a presenter joked that it was just like the Oscars because we’d been there two hours and were only halfway through. He was exaggerating a little, but the show did run quite a bit longer than usual. At least the weather was cooperative—unlike last year, when an incoming winter storm darkened the usually festive atmosphere. Besides, there were enough high points that most people probably didn’t mind sticking around. 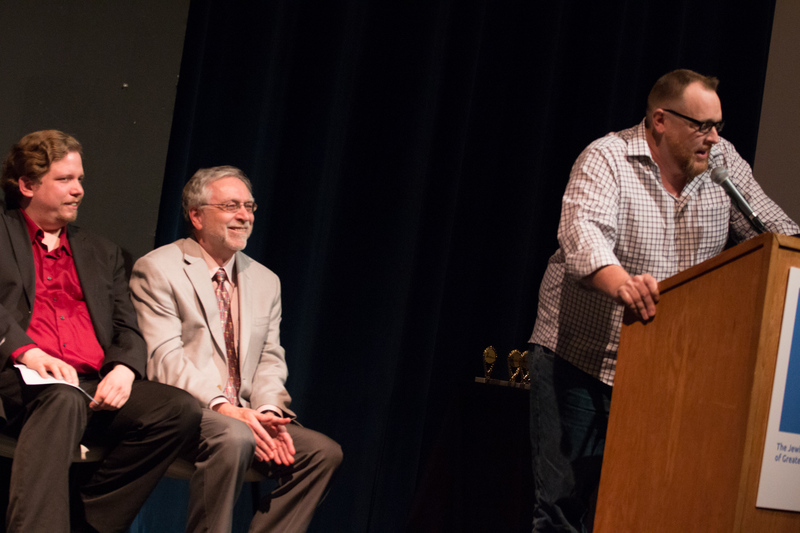 The Central Ohio Theatre Critics Circle provided one of the highest points: an appearance by Ed Graczyk. 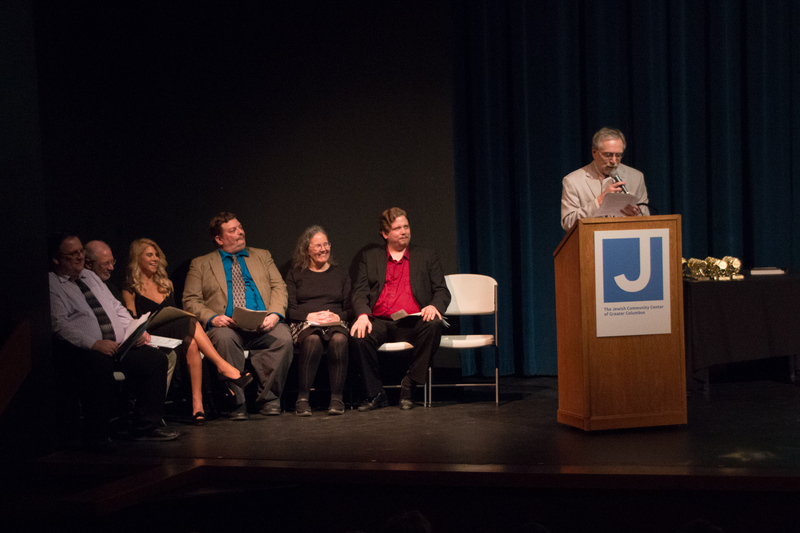 He received the circle’s Roy Bowen Lifetime Achievement Award for, among other things, leading Players Theatre Columbus for many years and writing the groundbreaking play Come Back to the 5 & Dime, Jimmy Dean, Jimmy Dean. Also honored by the critics were Evolution Theatre Company, Short North Stage, Shadowbox Live and MadLab’s former artistic director, Andy Batt. Before walking off with his citation, Batt delighted the audience by turning the tables on the critics, passing out both praise and pans to the people who’d long been judging his work as an actor and director. 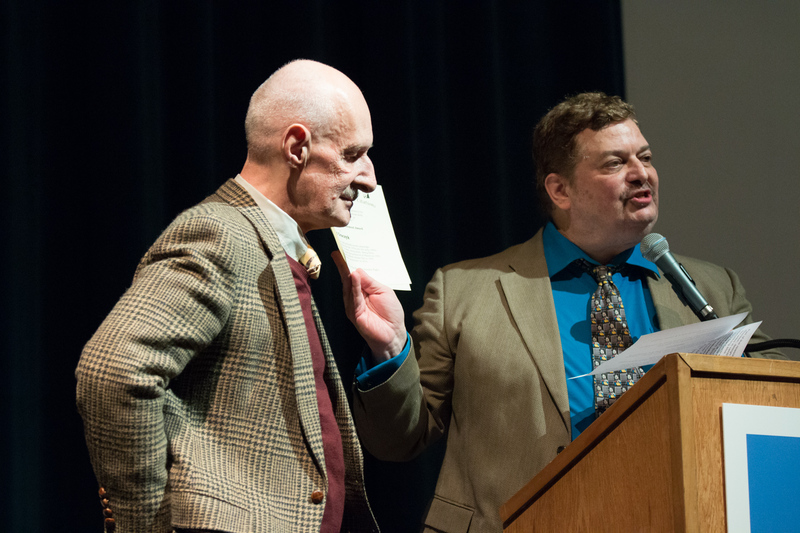 Later—much later—in the evening, critic Michael Grossberg received an honor of his own: the Roundtable’s treasured Harold Award. The group probably chose to present it this year because Grossberg officially retired in 2015 when The Columbus Dispatch’s new owners made dozens of staff cuts. But fortunately for the local theater scene, the Dispatch is still counting on him to lead theater coverage, the only difference being that now he’s doing it as a freelancer. The evening also included excerpts from 2015 musicals that were nominated for Roundtable awards. 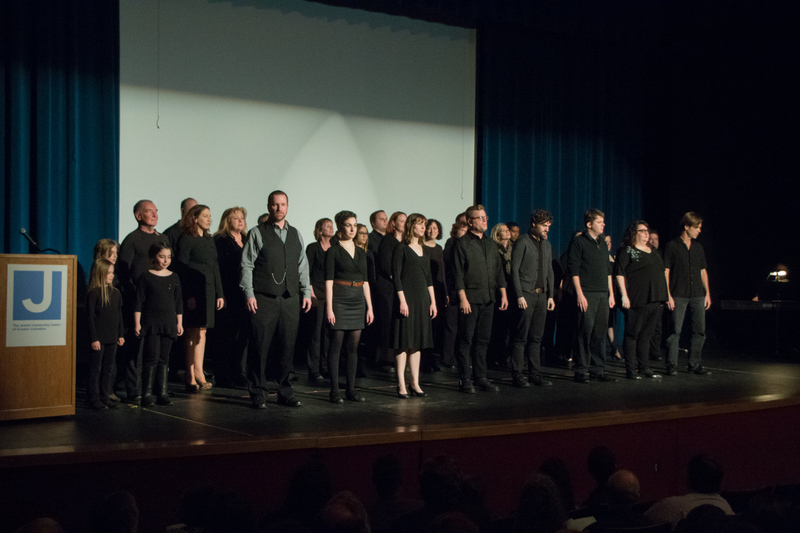 For me, the most exciting moment came when Gallery Players’ Les Miserables cast reassembled for a rendition of One Day More. It was a spectacular reminder of just how great that production really was. ▪ To Evolution Theatre Company and managing artistic director Mark Schwamberger for a lineup of 2015 productions that entertained viewers while fulfilling the troupe’s refocused mission of advancing the understanding of gender issues and exploring gay and lesbian themes. ▪ To Andy Batt, who stepped down as MadLab’s artistic director at the end of 2015, for leading the troupe through 13 years of growth and development that included its 2012 launch of an annual festival for high school playwrights and its 2010 purchase and renovation of a performance space and gallery that has helped to nurture both the performing and visual arts in Downtown Columbus. ▪ To Short North Stage for making a major commitment to nurturing new musicals in 2015 with its successful world premieres of The Great One, The Last Night of Disco and Krampus: A Yuletide Fable. ▪ To Shadowbox Live for celebrating its 25th anniversary by stretching itself with inventive rock tribute shows and collaborations, both local and international. ▪ A Roy Bowen Lifetime Achievement Award to Ed Graczyk, an accomplished director and nationally known playwright, who led Players Theatre Columbus from the 1970s into the early 1990s and wrote Come Back to the Five & Dime, Jimmy Dean, Jimmy Dean, a pioneering transgender comedy-drama that premiered at Players in 1976, ran on Broadway and became a Robert Altman film in 1982 and is celebrating its 40th anniversary in 2016. Clowntime Is Over has been touted as a typical MadLab play, and that’s an accurate description. Written by Joseph E. Green, it’s the kind of small, dark and weirdly offbeat work we’ve come to expect from the theater on North Third. But that’s not the only reason MadLab fans will eat it up. The play also gives them the chance to see two familiar actors spread their wings in unfamiliar ways. Andy Batt (who also directs) has never been averse to trying new things, but he’s seldom stretched himself as far as he does here. As TV clown Max P. Twinkle, he’s sardonic, morose and morbidly philosophical. He also has great comic timing, which helps to keep Green’s play from getting bogged down in existential angst. The equally familiar Stephen Woosley is normally less chameleonic than Batt, but there’s nothing Woosley-like about Paco, the mouse he plays during a short but spirited appearance. Just as Batt’s Max brings humor to the tale, Woosley’s Paco brings energy, and lots of it. Adding to the novelty of their performances is Suzanne Camilli’s liberally applied makeup, which ensures that neither Batt nor Woosley looks anything like himself. Green’s metaphorical story is set in the TV studio where Max normally presents his children’s show. One fateful day, however, he arrives to find his crew is AWOL. Even more strangely, the “bunny” and “llama” who also appear on the show seem to be just that: a bunny and a llama. At any rate, their costumes have no zippers in sight. Shana Kramer and Chad Hewitt play Susie the Bunny and Tidy the Llama, respectively. Of the two, Kramer’s Susie makes a stronger impression. Hewitt has been great in other shows—most notably as Nick in an early-2015 production of Who’s Afraid of Virginia Woolf?—but his portrayal seemed a bit too understated on opening night. The four actors—as well as an unseen snake that plays a pivotal role—do their thing on Brendan Michna’s creatively designed set. So what is Green’s play about? Oh, about 75 minutes. Sorry. I normally would have resisted such an obvious joke, but the show’s brevity happens to be one of its best qualities. It has some funny moments, as well as some biblically inspired ponderings about life and death, but it doesn’t hang together well enough to support a longer running time. You want my best guess? I think Green meant it as a Christian metaphor, but that doesn’t explain everything. Of course, one advantage of the show’s brevity is that you’ll have plenty of time to head to a bar or coffee shop afterward and look for your own meaning. And even if you don’t find any, at least you can bask in the memory of witnessing two familiar actors doing very unfamiliar things. 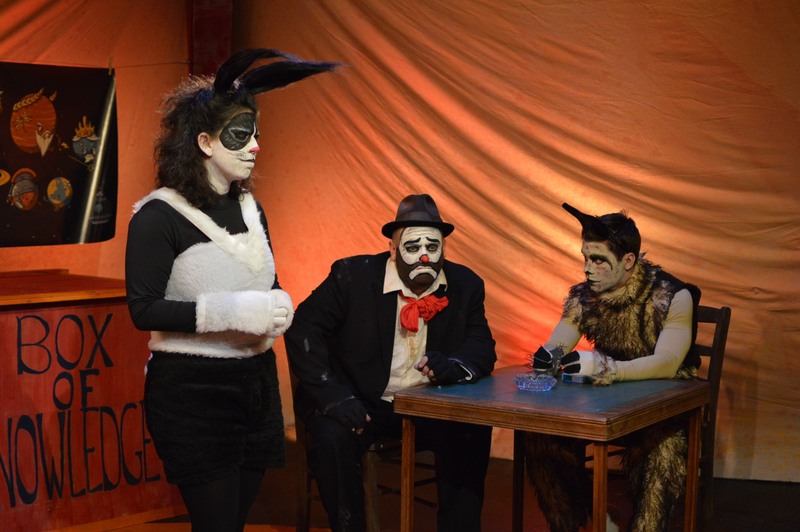 Clowntime Is Over runs through Sept. 5 at MadLab Theatre and Gallery, 227 N. Third St., Columbus. Show times are 8 p.m. Friday-Saturday. Running time: 1 hour, 15 minutes. Tickets are $15, $13 students/seniors, $10 members. 614-221-5418 or madlab.net.